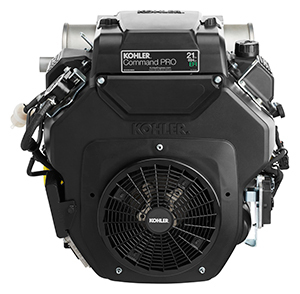 Kohler Co. integrated an electronic throttle body into models 694cc and 747cc within the company’s Command PRO EFI engine lineup. This technology electronically controls air intake to optimize an engine’s power and load response. When combined with Kohler’s closed-loop EFI system, the updated engines can provide quicker and easier starting, enhanced fuel efficiency and faster response in challenging operating conditions, according to the company. The company’s closed-loop system uses an oxygen sensor in the engine’s muffler, which continuously monitors the amount of fuel injected. If the fuel mixture strays from an ideal level, the sensor triggers adjustments to the amount of fuel injected into the system. Because EFI systems replace carburetors, carburetor-related issues and repairs are eliminated, including the buildup of damaging residue and carburetor corrosion that can occur when using ethanol-blended gasoline, according to Kohler.